Power outages are common in Nigeria and most countries, and an efficient inverter can be priceless during such situations.Don’t find yourself in the dark; instead pick up the best and quality inverter for your home. In this buying guide,we have assembled all the basic information that will help you understand inverter and ensure that you make an informed choice about which inverter will serve your needs best. A power inverter is a device that converts low-voltage DC (direct current) power to standard household AC (alternating current) power in order to run appliances in your home or office in case of a power cut. 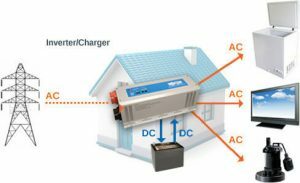 An Inverter allows you to operate household appliances and electrical equipment using the power produced by a inverter battery or renewable energy sources, such as solar panels or wind turbines. A UPS (Uninterrupted Power Service) also converts DC to AC, but the switching over time in such devices is much faster. An inverter will take at least 100 milli seconds to switch from grid power to battery power, when power fails. This is acceptable in case of basic simple appliances like lights and fans, but if a desktop is connected to the inverter, you will lose data until the backup kicks in. A UPS, on the other hand, takes mere 3-5 milli seconds, thus ensuring critical support and minimum damage to your sensitive electronic devices. Your choice, however, will ultimately be determined by your intended usage and your budget. These are the broad specs that you would see on any inverter. Voltage VA (volt-ampere) and KVA Rating: This rating determines the load an inverter can take. For example, an inverter may be of 1500VA, 2000VA or 1.5KVA, 2KVAetc. Later in this guide, we will explain how you can choose the ideal VA or KVA rating by calculating your power requirement. Battery Voltage: The battery determines how long an inverter can run. How long you plan to run your inverter will depend on the duration of power cuts in your area. The unit to measure is V or volts, for example, 12V, 24V, 48V etc. The voltage of your battery must match the specification on the inverter you purchase. Battery Charging Time : Many models of inverters indicate the time it takes for the accompanying battery to charge completely. Safety Features: Various safety features like audio alarm, short circuit protection, overload protection, over volt protection and auto reset feature are available and good to have in your inverter. Warranty: It is very important to always check warranty period on the inverter you plan to purchase. You may find it convenient to pick up the inverter and battery of the same brand, so that you only have to call one number for servicing either. Keep in mind though, that regular maintenance is not so much required for inverters, as it is for batteries. Other Basic Features : Inverters, these days, come equipped with LCD display and indicators that help you monitor available battery, charging time required, over load etc. In order to choose an inverter that works best for your home or office, the first step is to determining your power requirement during an outage.To know the total load (in watts) that you would need a back-up for, add the wattage of each appliance you plan to use on the inverter. 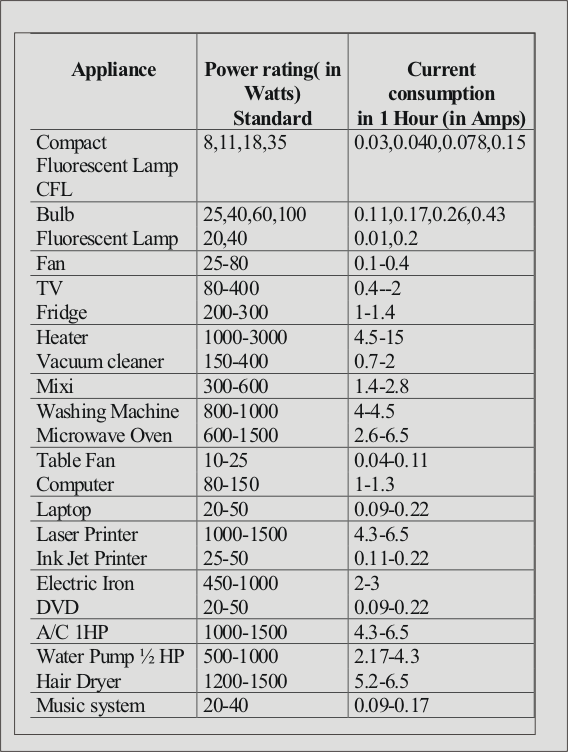 Here is an indicative list for some typical home appliances. You will find more detailed lists by research online or visit Kara Nigeria(the best online store for inverter) helpline, in case an appliance you plan to use is not listed below. Let’s say, when you add the wattage of each appliance you plan to use, you get a total of 2000 watts.Now, to get the VA rating of your inverter, we will perform a small calculation. VA is actually the power in watts (as calculated), plus any expected losses. So, you would need to multiply the total watts calculated with a factor called Power Factor (which indicates the efficiency of the equipment). So for supporting 2500Watts, you need an inverter of at least 2500 VA or 2.5KVA. But it is advisable to get higher Inverter power rating for supporting your power requirement. For the above calculation, 3KVA Inverter will be good . If you don’t plan to use all the appliances on your list simultaneously, you can lower the estimate of electricity requirement accordingly. If considering big appliances like motors, pumps and compressors (eg fridge, washing machine), don’t just consider their electricity consumption in running state, but the high initial power they consume to get started. Some large appliances these days come with special inverter technology. These are designed not to consume a great load of electricity while starting up. Inverters come with surge ratings. ‘Surge’ is when an inverter will run on a higher continuous power rating temporarily to start heavy loads. This rating is based on the maximum amperage and time duration that the inverter can run at the higher power level before cutting off or getting damaged. Find out your shortlisted inverter’s surge rating if possible, and accommodate it in your VA calculations. Lead Acid Batteries require regular maintenance. Electrolyte levels need to be checked and refilled every now and then.Even though inverters are run by lead acid batteries, those typically used in vehicles are not compatible with inverters because those types of batteries are built for delivering high currents for short spans of time, for example, starting the ignitions of vehicles. In fact, vehicle lead acid batteries are built to deliver less than a quarter of their rated capacities at regular intervals, and this makes them unsuitable for inverters.Batteries incorporated into inverters discharge at least half of their rated capacities for long periods of time. High-end batteries even deliver approximately 80 percent of their overall capacities and come with thick plates to prevent performance from faltering because of the need to charge them on a regular basis. Tabular Batteries are more expensive, but require lesser maintenance, offer higher efficiency and have longer lives. Tubular batteries are the most common type of power inverter batteries, due to the many advantages they offer, compared to standard plate lead acid batteries. These batteries are equipped with sophisticated designs, which ensure excellent electrical efficiency and increased lifespan and are perfect for a wide range of home and office installations because of their low maintenance requirements. Maintenance Free Batteries are sealed lead acid batteries that, as the name indicate, require little or no care. They are convenient because they require absolutely no type of charge or extra ventilation; however, they can be very expensive to maintain and typically come with a lower lifespan compared to regular low-acid batteries. These types of batteries are perfect for commercial or residential applications where regular battery maintenance is not feasible. Inverter Efficiency and Battery Charging :The efficiency of an inverter relates to the amount of power it consumes, and this usually ranges from 50 percent to as high as 90 percent from full to light load, meaning the optimum efficiency of an inverter is realized during maximum load. Inverter batteries normally require power from the main power source for a charge, and this is where the power efficiency of your inverter comes into play. Efficient inverters draw minimum energy from your main source to fully charge your batteries, while non-energy efficient types waste a significant amount of energy during charging sessions, leading to high energy bills. It is essential to look for an inverter with excellent power conservation to prevent skyrocketing electricity bills. 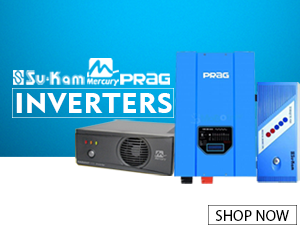 No matter the power requirements of your home appliances , you will have no problem finding exactly what type of Inverter and Inverter Battery you need on Kara.com.ng , the best online shopping website to buy all type of Inverter from top brands such as Sukam, Luminous, Prag, A and E, Mercury, Genus,Blue Gate,Mpower etc. All you have to do is browse through multiple product listings to find the Inverter, unit of Inverter battery and Inverter Installation kits that fits your requirements.The best advantages you will enjoy when you buy an Inverter from Kara Nigeria are excellent after sales support , Installation and guide on how to use your Inverter effectively. Delivery of Inverter and Inverter battery to any location in Nigeria is possible with flexible payment option.